The looming GDPR deadline is fast approaching, and as per usual when it comes to tedious (yet necessary) regulations such as this one, organizations have procrastinated and are now looking to quickly become compliant before the May 25th, 2018 deadline. That being said, certain companies aren’t at fault for this last-minute scramble. Organizations who were originally thought to be exempt from the largest data overhaul in recent history (such as companies that aren’t located in the EU, but house data of an employee, contractor, or customer that reside in the EU) must still be GDPR compliant. Long story short, there is no denying that we all will have to eventually comply to GDPR. In order to make this process more manageable, MDS has come up with 10 actionable steps that your organization can take now in order to avoid the substantial fines that come along with non-GDPR compliance. 10. Bring it all together for compliance! Some of these tasks may seem daunting and overwhelming, and as the first regulation of its kind, it is impossible to get every aspect of this regulation complete by the deadline. 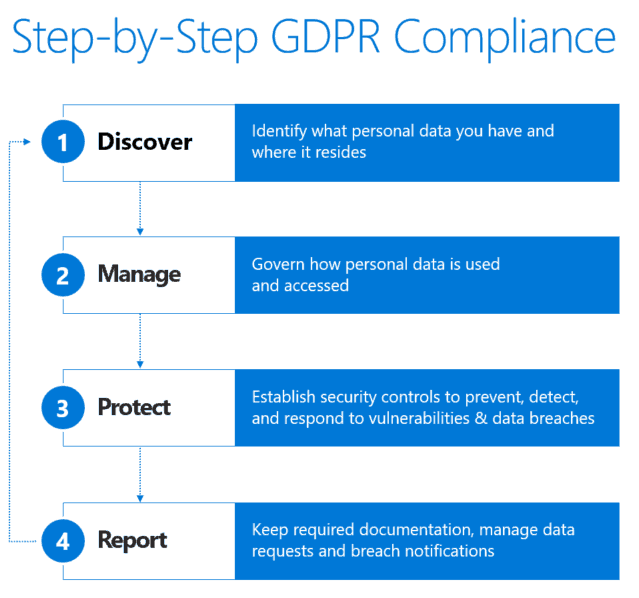 That being said, you need to make concrete steps to show that you’ve committed to eventually making your organization fully compliant with GDPR. With MDS you always have a compliance expert in your corner. One of our certified engineers will act as a trusted advisor to guide your organization through towards GDPR compliance while improving your overall data infrastructure and security in the process.